The late model Corvair rear motor mount don't last forever and NOS and rebuilt units are sometime hard to come by and always expensive. Within the last few months or so a replacement mount has become available that seems to be readily available and is about $35 or $40 less expensive. It looks like some ingenious soul has found a rubber cab mount from a newer pickup truck cab and modified it as an alternate motor mount for our cars. Clark's sells a version but I purchased mine from Lon Wall at Corvair Underground but it apprears to be no longer available (6/16). Since it's a new unit not core charges apply. The following is what you might call a product evaluation. My application is a '66 2-door. Taking the old mount out is a matter of removing the rear grill and the motor mount bracket cover and then placing a jack underneath the rear of the engine to support it while you remove the two nuts that hold the the engine to the mount. Four easy to remove bolts inside the engine compartment release the mount from the rear cross member. This is a side view of the mount. There is a steel plate bolted to it that is bent in on the top and bottom. 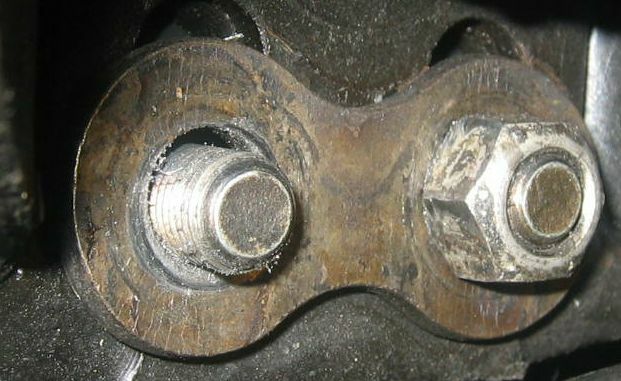 The bottom lip has the two mounting two studs and the top lip is the "fail safe" feature which would rest on the top of the car's rear cross member in the event of failure. In this view the top lip can be seen more clearly. A slot has been added to allow clearance for the decklid latch support. The mounting flange unit has four holes that correspond with the holes in the car's rear cross member. The passenger's side holes end up being too close the rubber portion of the mount so a normal hex head bolt cannot be used. Corvair Underground provides two socket-head cap screws which allow ample clearance. Two relatively minor problems were encountered during installation. The clearance slot in the upper lip of the mount wasn't quite wide enough to give all the clearance that was needed. A couple of licks with the grinder and a quick dab of black paint was all it took to make it right. The second problem was that the four holes for attaching the mount to the cross member weren't quite in alignment. On the original mount these holes are slightly elongated from side to side. A few minutes with a rat-tail file and all was well. 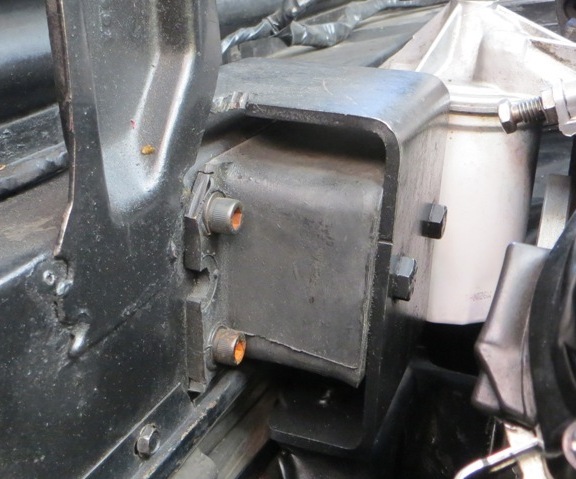 This view taken from the driver's side shows the mount installed and shows the clearance between the upper lip of the mount and the decklid latch bracket after the fix. One of the concerns expressed on one of the Corvair forums was that the motor mount studs were quite long enough to accommodate the "figure-8" washer under the nuts. As you can see here the exactly (and not one smidgen more) long enough to get the job done. The original studs were a little longer and had nice conical ends on them to allow for a little misalignment when the engine was lifted back in place. These do not, so you have to be right on the money - a tire iron helps! Gone are the days when you could hold your mouth just right and sneak the fuel pump by the motor mount when removing the engine. The pump will have to come off now! These two views show how the unit looks installed. Not original looking by any means but not out-of-place looking at all and very functional. Installed in January 2006. Now six and a half years later, the mount has "settled" in, as seen in the photo. It's doing it's job satisfactorily. This photo was taken in 2013. This photo was taken in 2018. No visible change can be seen. Conclusions: I like the unit. It wasn't a real joy to install because I had to do it twice to find out the slot and hole alignment problems. Other than that it wasn't much different than installing an OEM unit. Overall appearance is good and it functions well, and only time will tell if "hangs" in there. After six plus years, the mount is working well without problems. We'll see how it's doing in another six years. I installed one of these that I got from Clark's in my 1965 Monza convertible. I experienced similar difficulties getting in place but I managed to get it positioned without any grinding or filing. I was not able to use the figure 8 washer though. I put mine on in May of 2005 and so far so good (January 2006). The non-stock appearance bothers me a little but the price and functionality were right. Now that I have taken the initial steps (thanks Padgett) for installation, in my opinion this heavy duty mount is a good idea badly executed. Beyond the barely long enough, untapered bolts used for studs (GM made them long and pointy for a reason), and beyond the reported need to drag holes and slots as required (the LM OEM unit has slots for the mounting bolts for a reason), and beyond my uncertainty w.r.t. the effect on strength of welding on the heads of the Grade 8 bolts used to build it, the example I got from Clarks doesn't fit the figure-8 washer, which does fit the two LM and one EM motor mounts in my possession. It is no more likely to fit the engine cradle, which appears to have even less freeplay. It would seem that a jig was not used (as it should have been) to establish the alignment of the bolts used for stud. I'm not going to mill the washer and the engine cradle to accommodate this out-of-tolerance mount. I'm going to ask Clarks to replace it with one that fits the figure-8 washer. Then I can determine what milling is needed to get it to fit the frame. Jeff Brekke no longer have any of the mounts he was making, which I had heard were quite good? Had virtue of having replaceable inserts but I e-mailed Jeff and he did not have any. When he did they were a little more expensive. Mount had no indication of origin or any markings on it. Was part of a paper tag attached but not enough to read. I had to e-mail Lon to ask about them and are on page 28 of Clark's supplemental catalog. I couldn't use the "figure 8" washer under the two stud nuts, the studs weren't long enough I remembered these feeling a bit a bit short but remember the factory setting for the rear mount nuts (65 FSM specifications (in back) page 5) is 50-60 ft-lb. The picture on the right was taken after torqueing both to 50 lb-ft and then removing. 5.5 to 6 threads were engaged (turns before nut fell off) on both. Nuts were replaced and retorqued then one was removed again for the photo. Remember these are locking nuts so taller than most. Note that the threads come to within about a 1/16 of the end unlike the factory studs which have a tapered guide end. I believe this is sufficient though barely and another 1/8" would be nice. If someone with more expert/current knowledge has a different opinion please let me know. I know this is getting a bit AR but only took about ten minutes and it is 68 degrees in the garage.